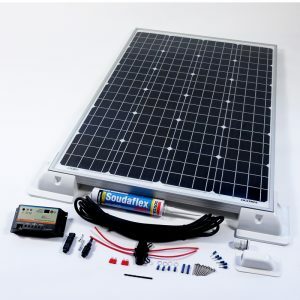 Using a twin battery solar panel charger kit or a solar battery charger that charges 2 batteries. Typically this is used to charge both the leisure battery bank and the engine battery. The advantage to this is full automation and increased battery life throughout. When you have a motorhome solar battery charger kit for 2 batteries fitted, leaving your motorhome in storage over the winter is no longer a worry. You can safely return in the knowledge that the engine battery will be fully charged and ready for action as well as the alarm will still be functioning and protecting. Once at site the main focus is then on the leisure battery. Every day the battery is topped back up to full allowing no hookup to be required. Wild camping is now a real option.